1787 Remains of the slashed & torn portrait by the Sherman Limner (perhaps Abraham Delanoy 1742-1795). 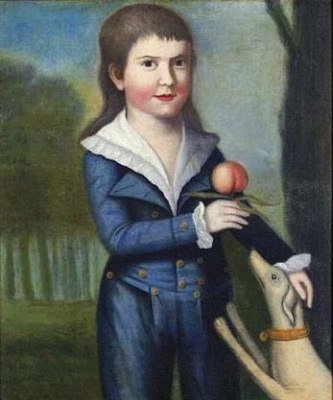 Rebecca Austin Mrs John Sherman & son Henry (1789-1817). 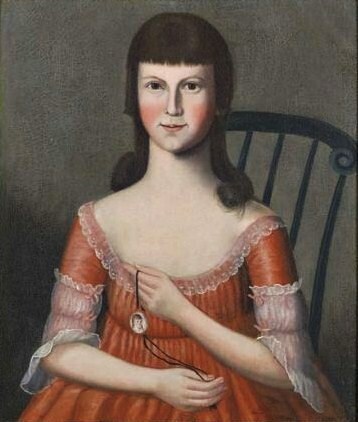 Rebecca Austin (b 1753) married John Sherman (b 1750) on August 28, 1771. He seemed to be a young man of great promise. They both came from good families. He was 21, she was 18. Rebecca & John had 7 children -- John in 1772; Maria in 1774; Harriet in 1776; Elizabeth in 1778; David in 1781; Charles in 1783; and Henry in 1785. 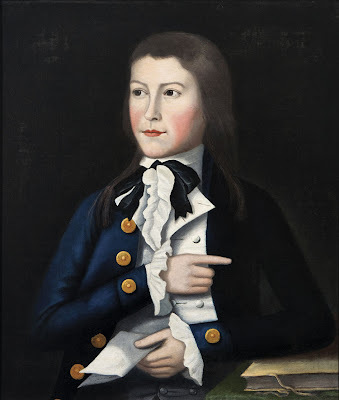 Although John Sherman served in the Continental Army during the Revolutionary War, he apparently returned home with some regularity. 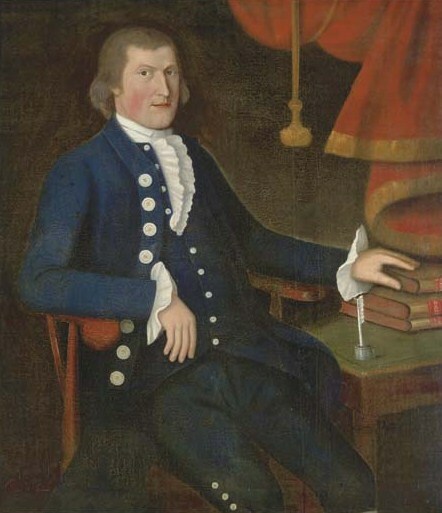 When he left the service in the summer of 1783, John Sherman tried his hand at business in New Haven for several years; but by 1788, he decided it was time to move on. 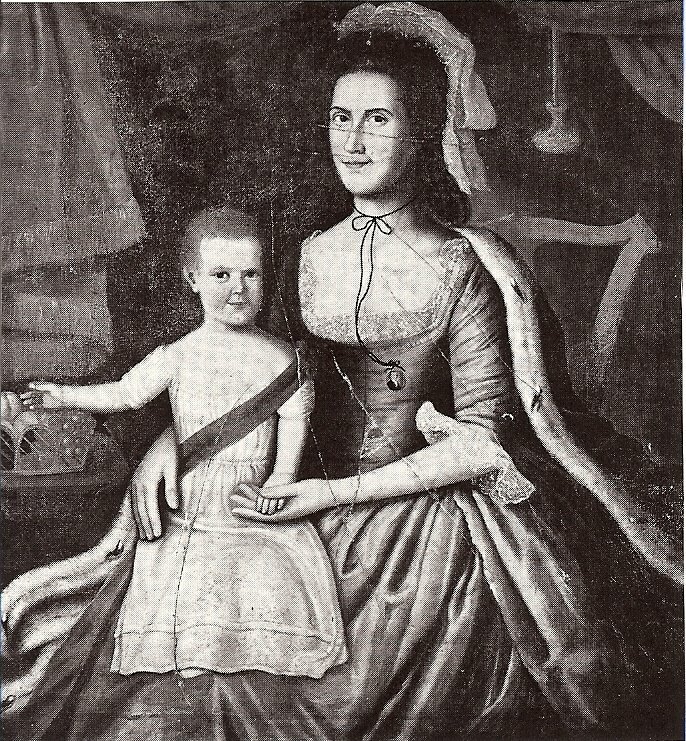 Just a year before John Sherman decided to leave the family, he had portraits of the family painted by the Sherman Limner, whose name derives from these portraits. Apparently the court determined that Rebecca Austin Sherman's allegations were true, and the divorce was finalized in January 1794. Rebecca Austin Sherman raised her children by cooking & running a boarding house, until she died in 1830. John Sherman almost immediately remarried Anna Tucker, 10 years younger than Rebecca. John Sherman had 2 more children with his new wife, supporting his new family as a shopkeeper in Canton. He died 8 years later in 1802, his younger widow lived until 1858. 1787 Sherman Limner fl 1785-90, Maria Sherman (Mrs. Ira Hart) 1774-1857. 1787 Sherman Limner fl 1785-90, John Sherman II.